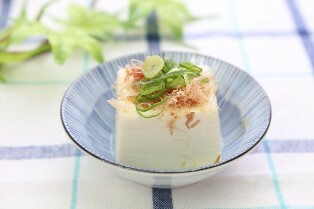 Hiyayakko ('冷奴', is classified into appetizer), is known as Chilled Tofu in English, and 冷豆腐 (Lěng dòufu) in Chinese. It is the washoku. Myoga Ginger, Dried Bonito Flakes, Scallion, Soy Sauce.